A few weeks ago, I decided to get back into running after a 5-year hiatus, and I discovered Spring: an app that allows you to walk, run, or bike to the beat of your favorite music. It was love at first run. Getting started was super simple: choose your workout, pick your favorite music genres, and get moving! Spring takes less than a minute to figure out your cadence, then starts playing music to match your moves. Here are my favorite Spring features after using the app for 2 weeks: Rhythm Based Movement. Studies have shown that running to the rhythm of music — meaning matching your SPM (steps per minute) to the music's BPM (beats per minute) — increases performance, endurance, and pleasure derived from working out. In my brief time using Spring, this has held true for me too. On my first two runs, I wanted to stop so badly at the 2-mile point, but -- like magic -- a great song would come on, make me smile, and keep me going. I'm now five 3-mile runs into using Spring and it hasn't let me down yet! And if you happen to not like a song, no problem. Spring works a bit like Pandora: love a song, hear more like it; hate a song, never hear it again. I love that it's immediately responsive to my feedback. Maps of Every Run. Spring uses GPS to map out your outdoor runs and tell you exactly how far you went. I only run outdoors, so I use this feature for every run. It's so nice to go back and see exactly where you ran, your total distance, and how long it took you on any given day. Bonus: The map shows you what song was playing at every point along your path! Simple Training Plans. Spring provides a bunch of training plans to guide you in preparing for almost any type of race. I really loved the fact that the training plans ranged from "Beginner to Half in 12 weeks" to "Master the Marathon." I just started the "Five Weeks to 5K" program and I am pumped! Once I committed to training, Spring automatically filled in my calendar for the next five weeks -- I've got an "assignment" every day (some days are just "Rest") to help me prepare for a 5K I'm running at the end of June. As a born-again runner who needs help staying motivated, I really appreciate this type of guidance and structure. HealthKit Integration. Spring writes all activity data to the Health app! This is particularly important to me because I like to track my activity info (along with all of my other health data) in One Drop, and my running data from Spring automagically appears in my One Drop timeline via the Health app. Free and open data sharing! Definitely! I'm a huge fan of Spring Moves and the Spring app. I would highly recommend Spring to anyone trying to start a workout program, whether it's walking, running, or any other sort of cardio. Music that moves with you might be just the motivation you need to keep you going. So far, it's worked for me! NOTE: We write these reviews to highlight products we like that help support a healthy lifestyle. We do this as service to our users. We are not paid for any reviews, nor do we accept payment for any products we review. The Spring app is a music service and exercise tracker. Spring uses music and rhythm to make runners go faster and farther - with less effort. 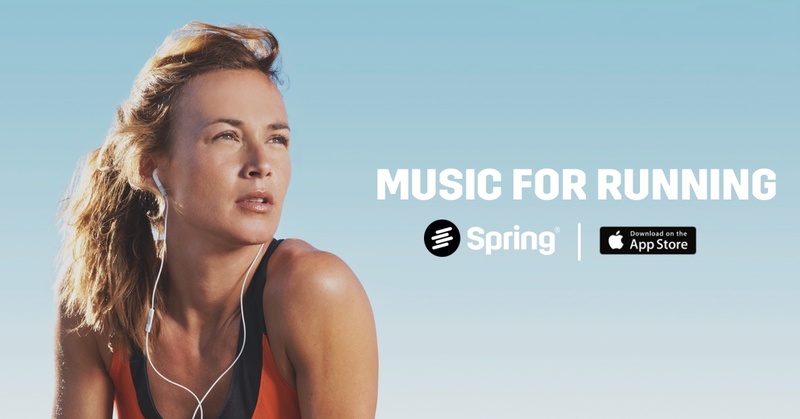 Whether you're logging your first miles or running marathons, Spring's playlists cater to all runners looking to improve cadence, form and performance. Start your 30-Day Free trial today.